These pieces, written in Handel’s early twenties, embody a kind of excitement and freedom, and a richness of ideas, that come from his contact with a different tradition and a sudden realisation that the musical world was larger and less constricted than he had imagined, tucked away in provincial middle and north Germany. You can hear him stretching his musical wings in this music, and it certainly doesn’t fail to take off in these very lively performances. The quickish tempi habitually favoured by Marc Minkowski are by no means out of place here. The Saeviat tellus, although little recorded, is pretty familiar music, as Handel recycled most of it, notably the brilliant opening number in Apollo e Dafne and the lovely ‘O nox dulcis’ in Agrippina. This is a solo motet, as too is the Salve regina, notable for the expressive vocal leaps and chromatic writing in the ‘Ad te clamamus’ and the solo organ and string-writing in the ‘Eia ergo’ that follows. Laudate pueri, which uses a choir, is another fresh and energetic piece: the choir of the Musiciens du Louvre do their pieces in rousing fashion, and there’s some happy oboe-playing, as well as fine singing from Kožená earlier on, in particular in the hugely spirited ‘Excelsus super omnes’. The biggest item is the Dixit Dominus, where the choir sings very crisply. The illustrative settings of ‘ruinas’ tumbling down through the registers, and the ‘conquassabit’ that follows, are truly exciting; and the long closing chorus is done with due weight at quite a measured pace. These splendid performances truly capture the spirit of these marvellous pieces. There are plenty of very good recordings of these anthems but this new one leaps straight towards the top of the heap (those preferring to hear boy trebles might already admire the excellent version by King’s College, Cambridge, under Cleobury, above). We have come selfishly to expect reliability, stylishness and honest fine musicianship from Harry Christophers, his singers and instrumentalists. Yet these fresh, spontaneous and vivacious performances are revelatory. Not only is the choral singing wonderfully clear, perfectly enunciated, beautifully phrased and impeccably tuned, but also the orchestral playing – an aspect too often relegated to auto-pilot in this repertoire – is brilliantly alert, bold and lyrical. Zadok the Priest never fails to make a strong impression even in average performances (and The Sixteen’s expertly judged reading is anything but average), but the special quality of this disc is that the other three lesser-known anthems also receive performances that allow them to shine just as brightly as the most famous (and shortest) anthem. My heart is inditing is radiantly performed (‘The King shall have pleasure in her beauty’ is gorgeously shaped), The King shall rejoice is splendidly poised and paced, and the first part of Let thy hand be strengthened conveys the perfect juxtaposition of forthrightness and elegance. Christophers’s sure direction locks on to the musical interest and richness of each section in the longer anthems (some other good versions rely on good openings and grand conclusions but the bits in between sometimes get a bit lost). Coupled with a sparkling account of the Organ Concerto Op 4 No 4 (superbly played by Alastair Ross, and with a magnificent choral ‘Alleluia’ finale created for the 1735 revival of Athalia), a couple of orchestral interludes and the last chorus of Messiah, the judicious programme avoids the overkill factor one sometimes encounters when all four anthems are heard consecutively. Donald Burrows’s booklet-note is ideally detailed and accessible, and overall this disc ranks as The Sixteen’s most exciting achievement in its impressive Handel discography. La Risonanza’s theatrically coloured playing has raised the performance standard for Handel’s Italian cantatas. Bonizzoni’s refreshing direction is entirely devoid of the coolly dispatched detachment or mannered feyness often found in this repertoire. 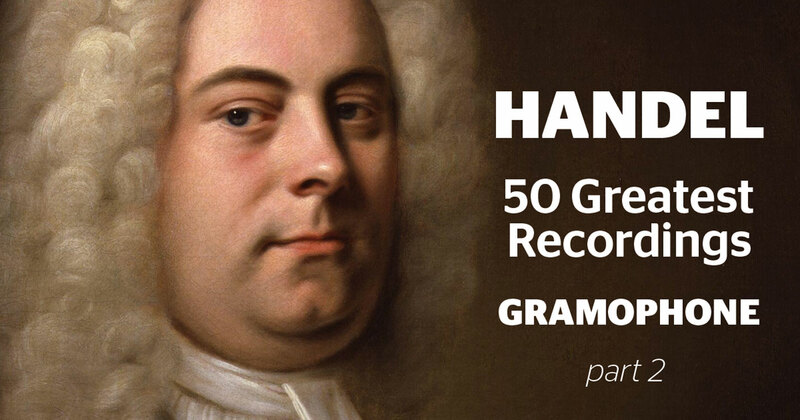 This lovingly prepared series promises to be of the utmost importance to Handel lovers. Recitatives are performed with perfect poetic clarity and dramatic timing. Bonizzoni’s Italian ensemble astutely diagnoses and communicates the Affekt of each movement in some of the youthful Handel’s most freely imaginative music. The balance between instruments is consistently fine, warm and lyrical. In particular, Bonizzoni has the admirable knack of conveying the strong rhetorical elements in Handel’s vivacious music, and the performances are beautifully executed with subtlety and charm. This is an essential series from La Risonanza, whose project is among the most rewarding Handelian discographic undertakings of recent years. Here are three of the 11 so-called Chandos Anthems composed for James Brydges, the Earl of Carnarvon (from 1719 the First Duke of Chandos). Handel’s music was tailor-made for fewer performers than those featured here. Nevertheless, the 40 members of the Choir of Trinity College, Cambridge, sing with flexibility and lightness. The opening chorus of O praise the Lord with one consent is crisply articulate and lightly shaped, and consonants are attacked with voracity. Most of the choral contributions have sweetness and delicacy. Stephen Layton lets the performers off the leash a little in the final pealing ‘Alleluia’ sections of each anthem, and in some dynamic passages of Let God arise, based on Dixit Dominus. The Academy of Ancient Music’s playing is often understated, and the introductory sonatas of Let God arise and My song shall be alway feature convivial oboe solos played by Katharina Spreckelsen. The four illustrious soloists excel in numerous short movements. Iestyn Davies navigates some difficult low passages in ‘Praise him, all ye that in his house’ (HWV254) without traces of strain. Neal Davies is authoritative, James Gilchrist is on fine dramatic form in ‘Like as the smoke vanisheth’ (HWV256a), and Emma Kirkby shows her stylistic intelligence and masterful communication of text in the radiant opening of HWV252. It is enjoyable to hear some of Handel’s lesser-known and more intimate English church music performed with such elegant restraint and skill. This completes the series of recordings exploring the smaller works Handel inserted into his glorious setting of Dryden’s Alexander’s Feast. Robert King has previously recorded The Choice of Hercules, which was created for the 1751 revival. The tenor cantata Look down, harmonious Saint was intended as the interlude for the original run in 1736, but was rejected in favour of Cecilia, volgi un sguardo. It’s a splendid idea to pair this seldom-heard Italian cantata with Dryden’s sublime Ode for St Cecilia’s Day that Handel created to fulfil the same function three years later. This is a mouth-watering performance of Handel’s colourfully gorgeous ode. ‘The trumpets’ loud clangour’ features Crispian Steele-Perkins on fine form, flautist Rachel Brown enchants in ‘The soft complaining flute’, and Jonathan Cohen’s cello solo in ‘What passion cannot Music raise and quell!’ is sweetly inspired. The King’s Consort and Choir perform with perfect juxtaposition of flamboyance and taste. James Gilchrist sings with authority: he’s a Handel tenor of the highest order. This recording is in a class of its own when it comes to the seemingly effortless, beautiful singing of Carolyn Sampson, now the best British early music soprano by quite some distance. She’s sensitively partnered by organist Matthew Halls in the sublime ‘But oh! what art can teach’, which has a breathtaking poignancy. Notwithstanding many agreeable past achievements, King has seldom produced a disc of such outstanding conviction. The Treaty of Utrecht concluded the War of Spanish Succession in 1713. Its terms were agreed principally between the British and the opposing French, but this caused disaffection among Britain’s German allies, including the Elector of Hanover (soon to be George I). The Elector was also disgruntled that his Kapellmeister Handel, absent and pursuing lucrative freelance jobs in London, composed a large-scale Te Deum and Jubilate for the Service of Thanksgiving held in Wren’s recently -completed St Paul’s Cathedral. The score of L’Allegro, il Penseroso ed il Moderato is presented here virtually complete. The soprano aria ‘But O, sad virgin’ is omitted, which, if you look at the marvellous opening for two cellos, seems savage indeed, but the music does rather lose its way in the long decorative passages for both voice and instruments, and its absence need not be regretted. The band is small and so is the superbly alert chorus. Playing and singing constantly delight by their delicacy. The three soprano soloists sound poised and clean-cut. Jennifer Smith’s high notes are an especial joy. Handel wanted a boy treble for two arias and presumably knew that their words were never very clear; this one produces some pretty sounds. The succession of charming miniatures is interrupted in the middle of Part 2 by more substantial items and a blaze of brilliant coloratura from several soloists. Martyn Hill’s ‘These delights’ is triumphantly good, and the choral singing is excitingly precise. The final chorus in Part 2, a fugue with four subjects, is sublime, but he did not bother himself unduly with the final chorus in Part 3. But in general this is very likeable music, its charm, conciseness and emphasis on word-painting unlike anything else in Handel. The sound quality is very good. Alexander’s Feast, an ode to St Cecilia by the long-dead John Dryden, was set by Handel in 1736 and revised many times. Subtitled ‘The Power of Musick’, it describes a banquet held by Alexander the Great after his victory over the Persians. The singing and playing of Timotheus inspire Alexander to drunkenness, pity, love and revenge, one after the other. What has this to do with the patron saint of music, you might well ask? The answer comes in a commentary towards the end, when Dryden contrasts Timotheus’s pagan skills with the invention of the organ and the celestial connections of ‘Divine Cecilia’, who ‘enlarg’d the former narrow bounds’. The music is superb, and it’s given a superb performance here. The Sixteen (actually 18, with two extra sopranos and an all-male alto line) are a little lightweight in the grander choruses but they sing with precision and unforced tone. Over a swiftly moving ground bass, ‘The many rend the skies’ goes with a swing; their finest moment, though, is their hushed contemplation of the Persian king lying dead on the field of battle. The lion’s share of the solos goes to Nancy Argenta, whose fresh tones, admirably suited to ‘War, he sung, is toil and trouble’, are cunningly and effectively veiled for ‘He chose a mournful muse’, an accompanied recitative in the manner of ‘Thy rebuke hath broken his heart’. Ian Partridge is superb in his subtle handling of the words, as he is with his wonderful breath control in ‘Happy pair’. Michael George is perfect in ‘Revenge, Timotheus cries’: hissing snakes, flashing sparkles and all. The orchestration is a constant delight. In some of the solo numbers Handel uses only violins and continuo; elsewhere he introduces a solo cello, a trumpet obbligato, recorders and horns. Best of all is the creepy middle section of ‘Revenge, Timotheus cries’, where he conjures up the ‘ghastly band’ of the Grecian dead with Neapolitan sixth cadences played by the violas and bassoons in octaves. All these opportunities are seized with relish by the Symphony of Harmony and Invention. In an unsuitable church acoustic, Harry Christophers sets unfailingly suitable tempi. And to add to our delight he includes the concertos detailed above that are integral to the piece. ''The first great English oratorio'': that was Winton Dean's view of Athalia in his classic study of Handel's oratorios 30 years ago. We have had several chances since then to hear the work, as well as its predecessors, and the judgement stands up well. Athalia, composed for Oxford in 1733 to a libretto that draws on Racine's play, tells the story of the usurping, apostate Jewish queen, Athalia, and her overthrow when the prophet Joad and his wife Josabeth bring the true heir, the boy Joas, to the throne. The action is pretty feebly handled by Handel's librettist, Samuel Humphreys (in particular it is never made clear what actually happens to Athalia in the end, or why); but several of the characters are quite strong and Handel grasps the opportunities offered him for striking music. Athalia herself fares best of all, musically, as one would expect; and it was a brilliant stroke of imagination to ask Dame Joan Sutherland to take this role in the present recording. She is of course a great Handelian, but is scarcely a figure one expects to see in early-music circles. In the event, the slight disparity of approach between her and the other members of the cast serves ideally to symbolize the separation of Athalia from her fellow-Israelites, putting her, as it were, on a different plane. Dame Joan uses more vibrato than the others in the cast, but the singing is truly magnificent in its grandeur and its clear, bell-like, perfectly focused tone. The sound is rather large against the baroque flute (very sweetly and gracefully played) and upper strings in 'Softest sounds'', her first aria, but better that than an unnatural, contrived balance. Just before this comes Athalia's entry, an extraordinary sequence with her tortured recitatives interrupted by the Baalites' choruses (designed to cheer her up: the music is in Handel's best carefree-heathen vein); Dame Joan is superb in the relating of her dream where her mother Jezebel appears to her. Athalia's part is not in fact a large one, with only two full-length arias; the second, ''My vengeance awakes me'', is an energetic piece which she throws off with enormous spirit (even if the ornamentation goes beyond the well-judged stylistic limits observed elsewhere in the set). Among the rest, Emma Kirkby is in her very best form, singing coolly, with poised musicianship, and with quite astonishing technical command at times. Listen to ''Through the land'', in Act 2, where the voice is beautifully balanced with two recorders and violins, the passage-work perfectly placed, the oddly shaped phrases pitched with absolute sureness, the thrilling a delight. Her Act 1 aria ''Faithful cares'' is finely done too in spite of a hint of clumsiness in the accompaniment once or twice James Bowman, as Joad, has his moments, and always sounds well, but I have heard him sing with more warmth and imagination. David Thomas is dependable in the often very vigorous music for the priest, Abner; and as Athalia's priest, Mathan, Anthony Rolfe Johnson sings in shapely fashion. The boy Joas is sung, as it should be, by a boy, in this case Aled Jones, who gives a very controlled, very exact performance, perhaps rather careful but of intense tonal beauty. I found the choral singing a little variable. At its best, for example in the chorus that opens the Second Act, it is first rate, spirited, forthright, accurate (and the recorded sound in this particular number seems to me outstanding in its perspective, brightness and clarity). Also first rate is the fine chorus ''Rejoice, O Judah'' that ends Act 2. But in certain of the others there is an air of the routine, and the result is wanting in character and expressive force. There is much good, crisp orchestral playing, though some of the Academy of Ancient Music's less positive characteristics are to be noticed too: an occasional moment of unsure ensemble, and a lack of broad shaping – the final Allegro of the Overture, spiritedly done but with no sense of cumulative force, exemplifies this. These are however small, perfectionist quibbles: as a whole these two discs, excellently recorded, give an admirable and often striking realization of a work with many choice things, and I warmly recommend it.